Toolset to help with the day by day maintenance work. The SilverStripe Maintenance module reduces your maintenance related work. Requires the composer.json and composer.lock files to be available and readable in the environment you plan to use this module. All information is based on these files. 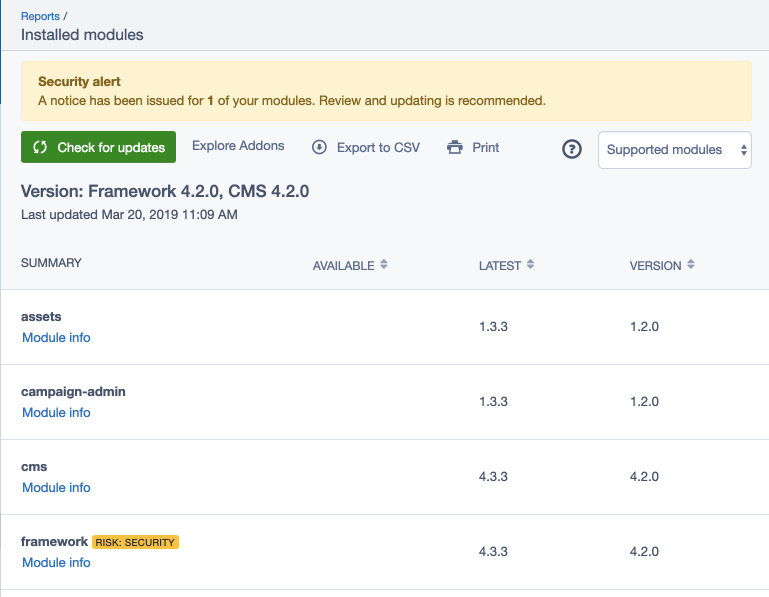 The queuedjobs module updates metadata on your installed modules in the background. You need to configure it to run those jobs. and present them as a report in the CMS under admin/reports. we recommend the installation of two additional modules. By default, tasks are run through a job queue. You can also choose to manually refresh via the command line. The report available through the CMS shows "Available" and "Latest" versions (see user guide). it likely means that you have "minimum-stability": "dev" in your composer.json. Please see the user guide section. contributing in the SilverStripe developer documentation.